We’ve had a lot of rain here in the UK over the past few weeks, quite heavy storms complete with thunder and lightning. Today I thought I would share the things I like to do when the weather keeps me indoors. 1. Finally read THAT book. Do you have a book that you’ve been waiting to read but just haven’t found the time? I find that a grey, rainy day is the perfect time to curl up on the sofa and get lost in a great book… Rain tapping on the windows is my favourite background noise for reading. Some books that have recently been highly recommended to me are The Lake House by Kate Morton and Nineteen Minutes by Jodi Picoult. Not a reader? Prefer TV? No worries… Fire up Netflix and choose a new TV show to watch. Try a new genre or a series that you’ve heard people rave about but haven’t got round to watching yet. My suggestions are The Vampire Diaries, Orange is the New Black, iZombie and Pretty Little Liars. You could also re-watch some old favourites, such as Gossip Girl or Dexter. If you like documentary style shows, Matt and I got absolutely addicted to Making a Murderer… You have been warned! YouTube. Welcome to this magical internet place where helpful folks create tutorials to show you how to do pretty much anything. You can copy Blake Lively’s hair. Or bake a rainbow cake. Or my personal favourite – book a holiday to Disney! My favourite China Glaze polish ever, For Audrey is a gorgeous green/blue shade that is a pretty perfect match to those Tiffany jewellery boxes. I love the gelly polishes from Barry M, and Pomegranate was my first purchase from the range; a creamy pink toned red perfect for any season. This looks great on toes too! Another gelly polish, Blueberry is a cornflower blue, very reminiscent of Essie’s Bikini So Teeny which I know is a very popular shade. Have a browse of online recipes or through any recipe books you might have lying around and choose something new to cook. I wrote a post with a few recipes I want to try – perhaps something will take your fancy? If you’re anything like me, you will have quite a bit of stuff you’ve accumulated over the years that you could probably do with getting rid of. Have a look through your possessions and be honest with yourself and clear out the things you know you’re never going to use… Skin care that doesn’t suit your skin type, old make up that’s seen better days, broken/tarnished jewellery – you don’t need it, so do yourself a favour and stop it cluttering up your home! Now and then, I like to pop a treatment on my hair and do a mini DIY facial, and what better time to do it when you know you’re not likely to be leaving the house for a while? I love the Bleach London reincarnation mask for my hair, it really deep conditions and leaves my hair feeling super soft, especially if I use a clarifying shampoo beforehand. On my face, I like to start with a deep cleansing mask like Sanctuary Spa’s 5 minute thermal detox mask, followed by Avène’s soothing moisture mask to re-hydrate my skin. Adult colouring books have become extremely popular in recent months, and I can really see why. They are a therapeutic way to pass the time… I feel so calm and relaxed when colouring in my books, and I genuinely believe sitting and colouring helps to ease my anxieties and worries when I’m having a tough time by giving me something to focus on and distract my thoughts. My favourite one is the Disney Princess Art Therapy book. I’m sure most of us bloggers have a ton of improvements or tweaks they want to make to their blog. You may want to finally get on baord with scheduling your social media. Or, you may simply want to print off a monthly calendar and plan your posts for the next month. 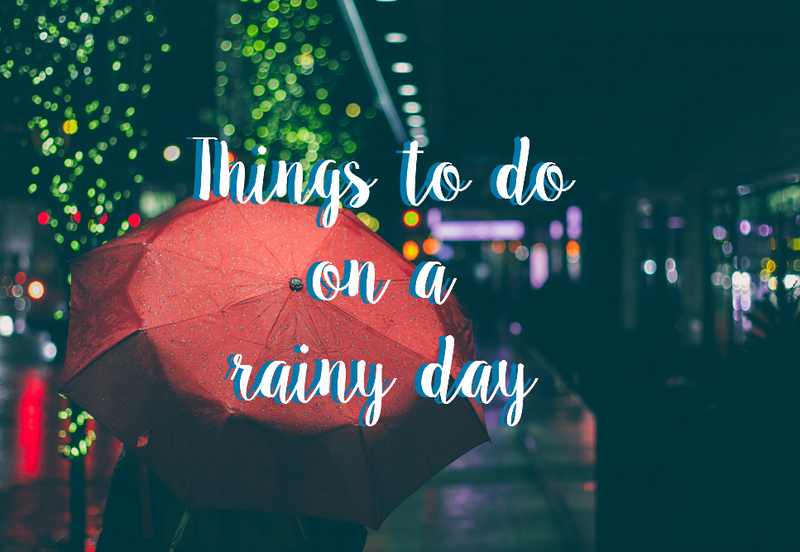 When rain changes your plans, make the most of this time, even if it’s half an hour where you start drafting a blog post or brainstorm some post ideas. 10. Tidy up your computer. Now I have a Macbook with less memory than I would like, I have to spend time transferring my files to my external hard drive every so often. I also take the time to delete files I no longer need, such as menus of restaurants I’ve downloaded or stock images that I’ve used for blog collages. A tidy computer = less hassle trying to find those files you do actually need! I also sync my iPhone and back it up when I’m doing this. So there you have it, my 10 favourite things to do when it’s raining. I hope I’ve inspired you to make the most of your rainy days!